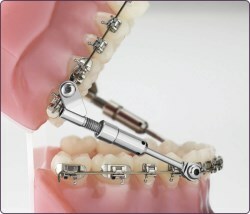 This is a type of orthodontic appliance that can be used to help treat a patients overjet. Typically, this will be used alongside a type of brace, but it can also work as a standalone. This is when you close your upper and lower teeth together but the front teeth are protruding forward, which leaves a gap between the upper and lower sets of teeth. Quite often this can be confused as an overbite, but an overbite will be when the upper and lower teeth are closed, and the uppers will cover more than half of the lower teeth. How Is An Overjet Caused? This can be down to your genetics or how your jaw is formed during the important development years. Research has indicated that is can also be down to finger/thumb sucking, pencil chewing, nail biting etc. If these bad habits are carried out over a prolonged time, they can aid the forming of an overjet. How Will Herbst Correct An Overjet? The herbst device works by stopping your lower jaw from falling backwards and helps to promote a healthy bone growth on your lower jaw. This helps to make your bottom jaw meet nicely with your top jaw. Will The Herbst Be Comfortable? When the device is first fitted it can take a small period of time where you become accustomed to wearing it. All modern day braces and devices have been designed with the thought of the patients comfort in mind, without making too much of an impact on your everyday life. What If I Suffer From Any Pain? If you do experience any discomfort, soreness, or pain, we urge you to book an appointment as soon as possible so we can check what is going on and make any adjustments as needed. Your mouth will be going through a lot of changes so it is important we regularly check on your progress. Ice cold food or drinks, as ice can freeze the cement and loosen up the device. Sticky foods – gum especially, as it can pull the device away from your teeth. Hard foods – any hard candy can damage and bend the device. When ever you go ahead with an orthodontic device or brace, we will always advise of the best practices so you can get the most out of your treatment and that it is enjoyable for you. If you would like to discuss your options with one of the dentists, please do not hesitate to call us today and book your free consultation.